General Relaxation – Relieve stress, relax and renew. Deep Tissue – Focuses on deeper muscle tissue to release chronic muscle tension. Pregnancy – Provide body cushions for your comfort and also do side-line depending on your stage of pregnancy and individual needs. Injury Specific – Promotes faster healing of soft tissue injuries and can reduce pain. Sports – Can focus on particular muscles specific to a sport or training program, incorporate stretches or work on sports specific injuries. Couples Massage-Couples can receive a massage in the same room at the same time. Each massage may include heated table, hot towels, hot packs, essential oils and tea or water. Infinity now offers an infrared sauna as a treatment option at our Hermantown location. Infrared saunas are an effective tool for natural healing and prevention. Click to learn more about the sauna and its benefits. Hot Stone Massage – Heated basalt stones are used to massage your body. The stones are then placed on key points of your body for deeper relaxation. The heat of the stones feels amazing in the muscle tissue. This session is very grounded and relaxing. Cupping – The practice of cupping has been around for centuries. The cups create suction on an area of the skin either by fire or a hand pump cup. The cups will then stay on for 10-15 minutes or they may be slid across the skin to break up deep scar tissue or knots. Cupping brings blood to the surface to promote healing, or dispel the stagnation in that area. Just a note that this may cause circles and bruising on skin. *Not be done on individuals while pregnant, with broken bones or on their period. 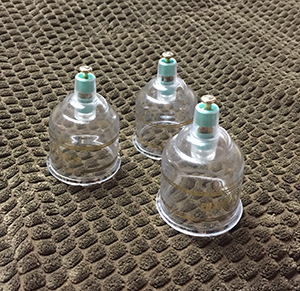 Glass cups used in the practice of cupping. Ear Candling – Simple and effective way to gently remove excess wax and toxins from the ears. This is a very relaxing, cleansing and non-invasive treatment. Long tapered hollow candles are lit and placed in ear canal. A therapist is with you the entire session using essential oils to work the head, face, sinus and lymph system. Rolfing was developed for removing restriction from the body. Its aim is to organize the connective tissue that defines our shape and structure. This fascia separates different tissues in the body, including muscle, bone and organs. The therapist employs skilled application of pressure to soften and change the length of the fascia. This results in body segments (legs, torso, arms etc.) becoming relatively more balanced with each other. A well balanced body uses remarkably less energy to move itself through gravity. This treatment is valuable for people with postural distortions, or chronic pain from injury and repetitive movement. Rolfing is also great for over trained athletes who lack flexibility and would like to improve their performance. Body awareness and freedom can be also be gained as well as a greater sense of well-being. Osteopathy is a drug less, patient-centered treatment that enhances the body’s ability to heal itself. Students of the Canadian College of Osteopathy go through an extensive 5 year undergraduate training plus an additional 2 years of research to develop highly refined palpation skills. This extensive training is based on knowledge and understanding of anatomy and physiology of the body. Treatment involves all aspects of the body including: structural, myofascial, visceral, cranial sacral and vascular. The World Health Organization recognizes osteopathy as a distinct manual therapy that differs from chiropractic or physiotherapy. The Canadian College of Osteopathy suggests that treatment be used not as an alternative to conventional medicine, but complementary to it. Infinity Massage and Wellness is excited to offer these modes of treatment through independent contractor, Rosslyn Kendrick. For more information on her practice or to make an appointment, call her directly at (218) 600-0132. *Offered by independent contractor Rosslyn Kendrick. Call her directly at (218) 600-0132 to make an appointment. Your treatment time is reserved especially for you. We ask that any changes or cancellations be made at least 24 hours in advance, out of respect for our therapists time and energy. Cancellation fees will be applied. Please arrive 15 minutes before your scheduled session in order to fill out a client health intake form. This also gives you a chance to meet your therapist and relax your mind and body before your massage session starts.